It’s no secret around these parts that I have a great fondness for deck building card games. It also may come as a shock to you, me being a writer on a website and all, but I am rather fond of the fine art of word-smithery. Never did I think the two would be joined in such a perfect and holy union as they have been in Tim Fowers’/Fowers Games Inc.’s Paperback: The Game ($3.99). It’s like the love child of Ascension: Chronicle of the Godslayer (Free) and Scrabble ($7.99), and while it could use some more meat on its bones, it’s a beautiful little baby. The idea is that you and your opponents are competing authors of kitschy genre novels. The kind of pulp novels that often follow the same old conventions with few changes because that’s exactly the familiar or even nostalgic experience the audience keeps coming back for. Not to undersell the effort and skill required to write them. I’ve only written a few kind-of sort-of passable short stories in my time, so no judgement here. Anyway, the theme is really more of a window dressing. The gameplay isn’t about creating stories or sentences, though my creative brain was firing with such ideas as I thought about this game. 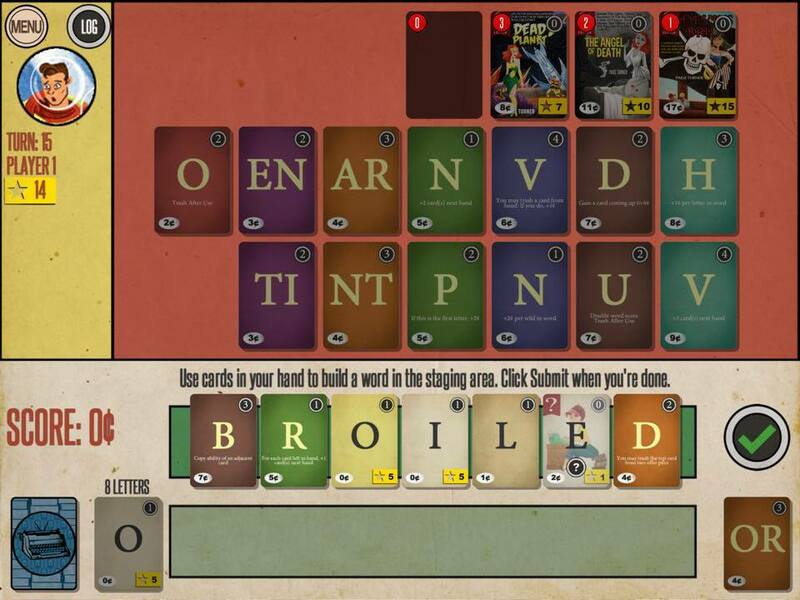 The gameplay is Scrabble with a few glorious plot twists. To start, every player of the possible two to four is given R, S, T, L, N, and five wild cards. In addition, every player has access to the common vowel deck. These letters are used again and again without belonging to the players. Like a free public card. Unless they win that card by being the first to put out a word of a certain letter length, with each card won upping the letter count. Anyway, wild cards are important early on as they’re basically your only means of completing words. However, they can quickly outlive their usefulness. Once you’ve made a word that the game recognizes as legit, the point values along the top of the cards will be added up. Each point converts to one cent. You’ll use these good cents to purchase new letter cards and trashy novel fame cards, which are also wild cards. These are the cards that are worth fame points, which is what you accrue the most of to win in the end. The common vowel length deck cards that you win are also worth fame points. No wild cards, fame or starter, are worth any actual points though. And this is what I was referring to. They can become a hindrance as you need more points to buy better and better cards. Here is where the deck building aspect comes in, and similarities to my favorite deck builder, Ascension. Higher level cards come with bonuses and abilities. Like turning the card next to them into a wild card but retaining the point value, or letting you draw an extra card or three next round for a potentially huge word, or simply increasing the number of points you get. Sometimes you’ll have to meet certain criteria, like starting or ending a word with that specific card, to activate the effect. These bonuses are both limiting, but likewise spawn creativity. One of my favorite strategies in Ascension, if void cards are available early on, is to cull my deck of all 10 weakling starter cards so that every hand I put out is much stronger over all. Similar strategies show up here. I immediately grab any card that allows me to trash undesirables in my deck. The game is won when all common letter cards are gone, or more likely, when 2 piles of fame cards are gone. While I love the mechanics and the style of this game, it can get boring pretty quickly without flesh and blood humans to play with. Naturally you can play against up to 3 AI opponents scaling from easy to smart to smarter AI, or you can pass and play with 3 human opponents, or any combination in between. The only AI that poses a threat to me now that I’ve learned the game is the hardest one. I nearly double the score of the second-place opponent lately. There’s a lack of any kind of achievements to work towards either. I wouldn’t call this game all skin and bones, but it’s definitely a little malnourished. The App Store references the actual 2014 board game this game is a port of, but it’s a fairly incomplete port. On one hand, the actual card game would likely be more fun as you could use house rules to allow for proper nouns or fictional terms. 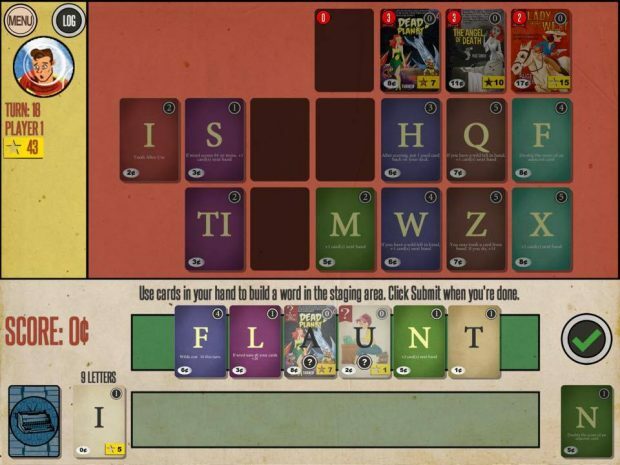 The physical game also includes attack cards to steal from or otherwise harm the other players, and even a cooperative mode where you work together to make the best words possible. Certain other special abilities like player powers and award cards add yet more variety. 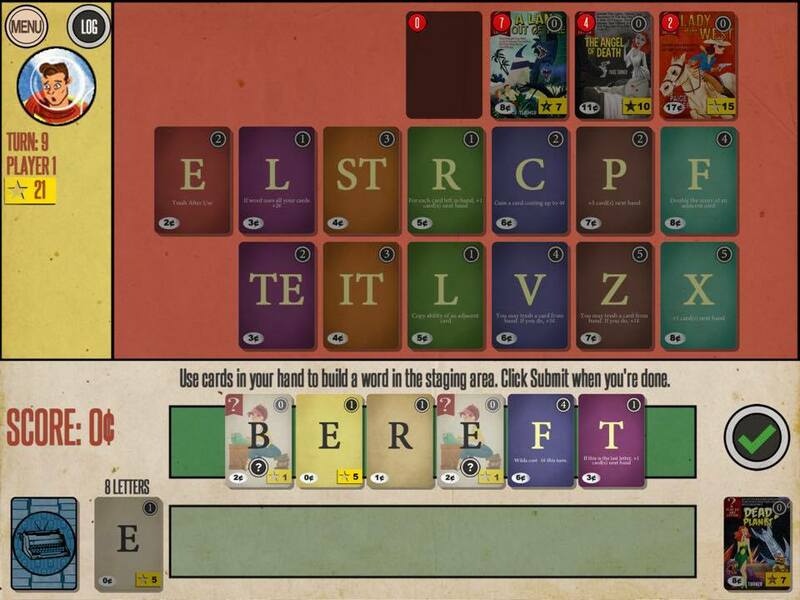 Space-bar cards allow you to legally form two words and even gives a point for the space, while dyslexic cards allow you to switch the order of any two letter card for a potential bonus. All that stuff sounds awesome, and I really want to try it. But I’m not going to discount the value of this port. 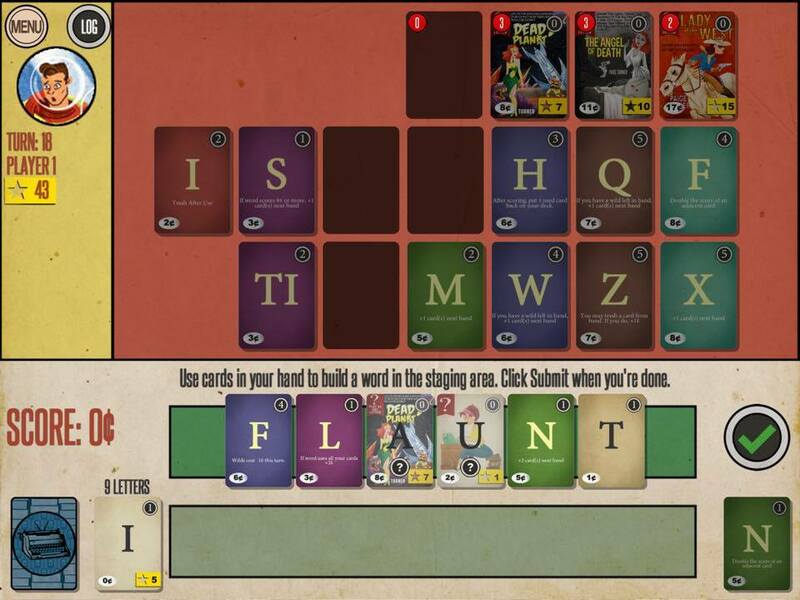 You can see a bunch of info on the game on this site, including a PDF of the full rules. The more cynical side of me thinks that this video game version exists to make people want to play the card version. Because that’s exactly what I want to do now. But I’m glad I’ve played this version, and it’s way cheaper and easier to use anyway. I would love to see these other modes and expansions added to this version of the game, but I understand that’s an expensive process. The AI throws out some questionable words at times, so there might be some errors or typos in the internal dictionary of the game as well. I did experience two crashes just for the record. Criticisms aside, this is my kind of game. My criticism comes from a place of love in this case. Beyond the solid mechanics, I love the style of this game. The art from Ryan Goldsberry is fantastic in general but especially in regards to the faux novel covers of the fame cards. The tone is just perfect. I even like the easy listening jazz back track. Games like this are worth supporting, and while you might not play much without human opponents, you’ll probably be glad you did. 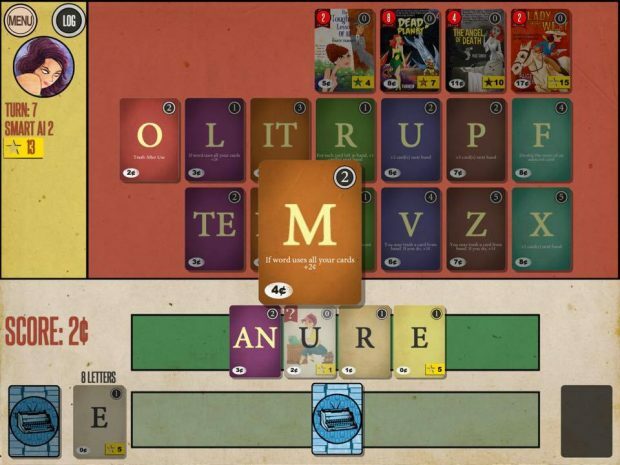 If you like word games or unique card games, this is a must buy. If they ever add online multiplayer, it’s especially a must buy.